The Royal Master TG12x4 centerless grinder is an abrasive finishing tool where the workpiece is supported between two rotating wheels, without any workholding. Centerless grinding is not usually used for anything other than surface finishing, but it can be used for very high-volume runs. TG12x4s are precise to the micron level, and need only about 5 minutes of changeover time and 5 minutes to change the grinding wheel. Centerless grinders have no need for workholding or mounting of parts. All the operator needs to do is insert the piece between the wheels. In most cases, the wheels will be oriented so that the part passes through the wheels automatically and only needs to be caught coming out of the other side. Thus, centerless grinders are the premier choice for quickly finishing simple cylinders. But they can also round out-of-round workpiece blanks and reach roundness, surface finish, and dimensional tolerances better than most other processes. View specs on either of our rebuilt Royal Master TG12x4 grinders here or here. We also have a CNC grinder available, in which the machine automatically feeds and catches the workpieces. For answers to your questions or more information on Royal Master TG12x4s (or centerless grinders in general) call Liberty at 847-276-2761 or send us an email at sales@libertymachinery.com. 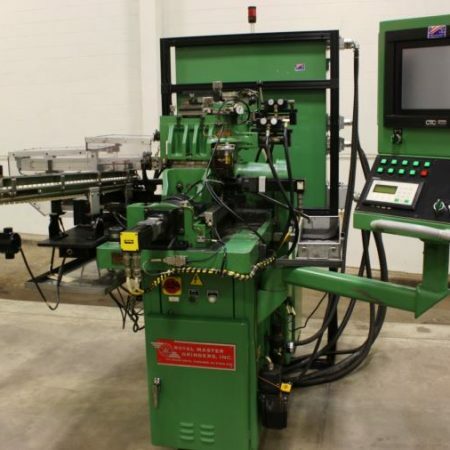 Liberty Machinery buys and sells high quality Royal Master TG-12x4 Centerless Grinders.